You Are Here: Home » Local News » Junior Fire Explorer Summer Camp was really a blaze! Junior Fire Explorer Summer Camp was really a blaze! As a kid growing up a lot of boys in school, when asked, “What do you want to be when you grow up?” and they wound respond, “a fireman.” Well at this camp you could get more than you bargain for. This camp exposed the students to more than just life inside a fire station. 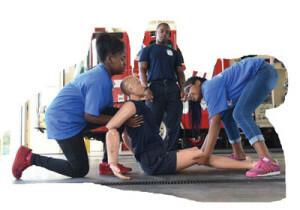 Mount Bethel Human Services Corporation partnered with Fort Lauderdale Fire Rescue, Fort Lauderdale Executive Airport, Fort Lauderdale Emergency Management and Public Safety Chaplancy to host the first ever “Junior Fire Explorer Summer Camp for Middle School Students” held in Broward County. The Camp was held June 12-16, 2017 from 8 a.m. to 4:30 p.m. at Fire Station 53 which is located at Fort Lauderdale Executive Airport. It has been long overdue to have a program like this for younger intercity kids. Twenty-five students were able to attend the week long camp free of cost and received breakfast, lunch and snacks along with lessons in emergency preparedness, radio communication, Hands Only CPR, how to drag/carry someone from danger, how to escape a burning room and how to use a fire extinguisher. “I liked the fire rescue practices and knowing what to do if I were in those situations. I also loved the tours,” said one of the students, Courtnie. Fort Lauderdale Fire Station 53 permitted students t to see where the firefighters eat, sleep, and relax along with viewing the Engine, Rescue truck, Hazardous Material truck, Aircraft Rescue and Fire Fighting (ARFF) truck and Fort Lauderdale Emergency Operations Center (EOC). The students were able to watch the planes take off and land daily from Executive Airport while enjoying their breaks. Broward County Regional Dispatch Center in Sunrise allowed students to see and hear emergency calls come in and witness how the Dispatchers handle sending emergency vehicles to a call and they were shown the different types of calls. Fort Lauderdale Executive Airport allowed the school bus to travel on the taxiway and runway system while the students were being transported to the south side of the airport which gave them a chance to learn what the different colored lights and markings mean that distinguish the difference be-tween a runway and taxiway. The airport tour consisted of a trip around the entire airport, complete tour of Banyan Air Service, seeing the ARFF Truck simulate putting out an airplane fire, and the airport maintenance building where they were shown the different types of equipment it takes to maintain the airport. Fort Lauderdale Fire Museum sponsored a tour where students learned Hands Only CPR from Fort Lauderdale’s CERT members, and spent the afternoon doing simulations on how to use a fire extinguisher on a stove fire in the kitchen and how to escape a bedroom fire in the Fire Safety Trailer. Overall the students had a week full of new learning experiences and were exposed to numerous career opportunities as they were given the chance to board a plane, handle a charged hose line, and dress out in bunker gear. “I liked the airport and the fire and rescue simulation part of the camp and I would like to come again,” expressed Talia.